Mojo Workin’: The Old African American Hoodoo System (Champaign: University of Illinois Press, 2013) 248 pp., photos, index, $85 (cloth), $28 (paper), ebook available. Hazzard-Donald teaches anthropology and sociology at Rutgers University-Camden. She is herself an initiate into the Orisha religion, but this is not a work of ethnography or autoethnography. Her notes list some conversations with informants — rootworkers, etc., but Mojo Workin’ is based more on published sources, many from the 1890s–1920s, than on systematic fieldwork, apparently. She saves descriptions of eight informants, including two fellow academics, for the book’s end, rarely quoting them in the text by name. She divides American hoodoo into two (mainly) chronological categories: (1) Old Tradition “Black Belt” Hoodoo, as practiced in the South from slavery days up until the “great migration” to Northern cities, and (2) “Snake oil” or “marketeered” hoodoo, which is more commercial. This she contrasts with the “exploitive” second version, the hoodoo of “curio shop” and candle shops, dream books, ads for “Sister This” and “Mother That” in magazines and newspapers catering to black readers, and Internet sellers of hoodoo supplies, mojo bags, etc. And who is behind this “snake oil” hoodoo? The Jews. Today’s Internet-based supply businesses, such as Lucky Mojo (whose owner, Cat Yronwode, happens to be Jewish), receive her particular scorn. According to one end note, Hazard-Donald tried to interview Yronwode by telephone, flaunting her Orisha credentials, and got the brush-off, which made her furious. But is “succumb” the right verb? Any folklore scholar could tell you that the line between “traditional” and “commercial” is thin and mutable. Hazzard-Donald, for example, makes much of the Sanctified black church’s traditional Ring Shout’s connection with African religion. Here, for instance, is a self-consciously folkloric Ring Shout, while here is one whose participants were trying for a spot in the Guinness Book of World Records. Authentic? Staged? Commercial? Given that most definitions of “religion” are based on scriptural and credal traditions — and hoodoo is neither — I would have liked to see how it fits a category of “religion” even when blended with the Sanctified churches, as when psalms become incantations to accompany a working or when, as Hazzard-Donald describes, yesterday’s conjure man becomes today’s charismatic preacher. “System” or “religion” — how do we talk about these things? Hoodoo, like polytheism and animism, challenges our ideas of what “religion” is? In a two-part interview, the Black Pagan blog talks with Khi Armand of Conjure in the City , who has a shop and practice in Brooklyn. There is the inevitable discussion of “nature religion” in the city. I think that [living in an intense, man-made environment] would be subjective – every locale has is ups and downs. Being on overcrowded trains everyday makes me put more emphasis on spiritual cleansing and being surrounded by concrete does mean that it takes effort to get to “nature.” But I’m all the more appreciative of ivy growing up in a brownstone and all the more in awe of when a neighborhood decides to start growing its own vegetables. I’m attracted to the goal of creating a sustainable earth-centered life in the midst of all this. I also think that magick might work quicker – in a city of 8 million people, you could virtually do a love spell in the morning and meet your new partner that night! Also discussions of shamanism, grad school, and film-making. Go read. There is a connection to Catherine Yronwode’s operation too. Mojo & Materiality: Lucky Mojo Curio Co.
Mexican devil image, left, from Lucky Mojo. Candle from Montréal Pagan Resource Centre, both on my desk. When the AAR met in Montreal in 2009, we not only had our first session on idolatry/materiality from a Pagan perspective, but also the Magical Mercantile Tour of Pagan and occult-related shops and meeting places. This year’s tour revisited the concept under a slightly different name, a tribute to our second stop, the Lucky Mojo Curio Co. in Forestville, Calif. (The first stop was Isis Oasis.) The tour was made possible by Julie Epona and Morning Glory Zell of the Church of All Worlds. 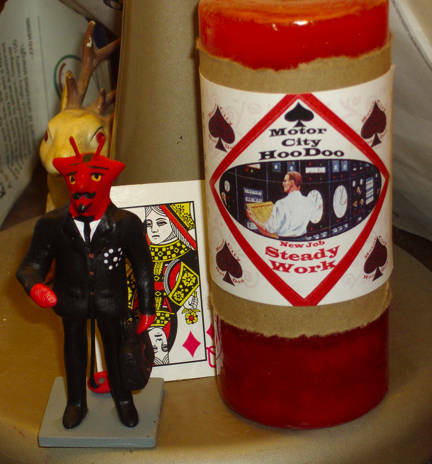 Lucky Mojo employs a small staff in mail-order product sales, hoodoo lessons, and counseling. 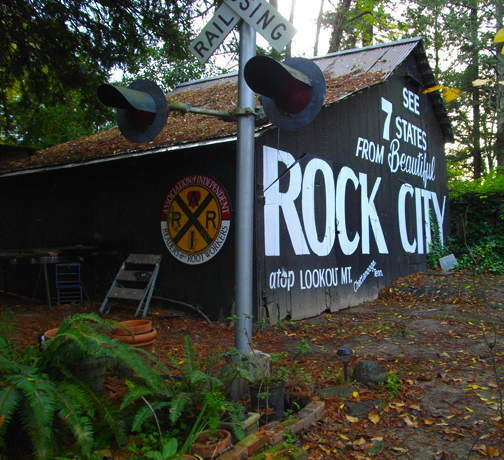 The first thing you see when walking up to the shop is a shed painted with a version of the “See Rock City” advertisement painted on barns throughout the Southeast and Lower Midwest. The shed displays an iconic Tennessee advertisement. The Rock City ad not only sets you up for what has been described as Lucky Mojo’s “1930s Memphis” aesthetic, but since founder Catherine Yronwode has a background in graphic-novel and comics publishing, I suspect that it might also be a reference to Neil Gaiman’s American Gods. Catherine Yronwode in her shop. That is Lucky Mojo: ironic, postmodern, humorous—but still serious. My other souvenir is a classic wooden-handled cardboard fan, of the type handed out by funeral parlors in the pre-air-conditioning era. One side shows a soppy portrait of Jesus as The Good Shepherd, while the other advertises the ambiguously named Missionary Independent Spiritual Church, located adjacent to the shop and office. Interior of the "smallest church," with Catherine's partner, Nagasiva Yronwode, peering in the window, and the Good Shepherd fan and devil figure (also shown above) on the table. 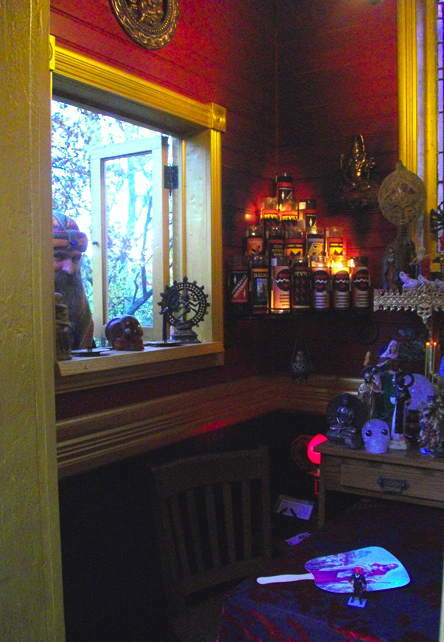 It has just a small table and two chairs for card readings, etc., plus altars for placing help requests according to their elemental correspondences. 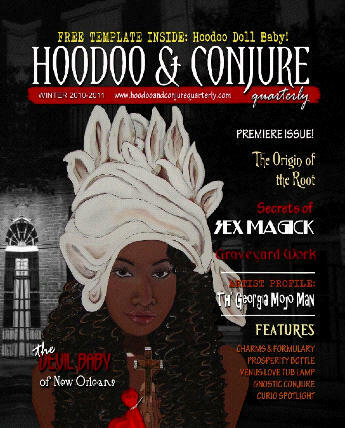 Hoodoo & Conjure Quarterly is a new journal on Southern magic and folklore, and you can buy it on Amazon.com (follow link above). 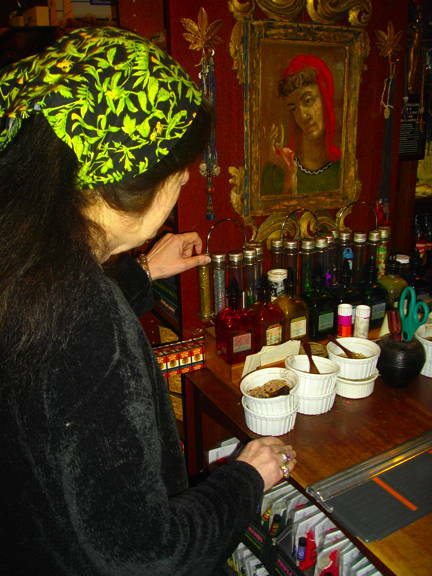 And there are several formulas for magickal oils and powders, a little lagniappe (that’s Cajun for a little something extra) magick, a free conjure doll baby template, and a historical text related to Voodoo in New Orleans by Lafcadio Hearn. Maybe these are people who don’t worry about whether there are pentagrams on the tombstone—they are there for the graveyard dirt. People enter hoodoo through the door of suffering, to borrow a phrase from the Umbandistas. In the early 20th century, white pharmacists in black neighborhoods began marketing hoodoo items through mail order after noticing they were fielding a lot of questions from their black customers about roots, herbs and potions. Their shops fell on hard times in the 1970s, in part because many African-Americans began to view hoodoo, also known as rootwork or conjure, as backward, say scholars who study the practice. “As African-Americans came more in the mainstream and more affluent, they were embarrassed by this stuff,” says Carolyn Morrow Long, author of Spiritual Merchants, a book about hoodoo stores. Among the businesses features is the Forestville, Calif.-based Lucky Mojo Curio Co., which also figured in a recent journalistic book on magic in America. “I listened to your grandmother when you didn’t,” owner Catherine Yronwode tells her black customers—and, I suspect, Prof. Hazzard-Donald. From the Motor City Hoodoo line by Coventry Creations of Ferndale, Michigan. Cremains were the apparent target in this case from Los Angeles. It sounds to me as though the accused grave robber was making up her own kind of “goofer dust”. I did finish Christine Wicker’s Not in Kansas Anymore: A Curious Tale of How Magic is Transforming America. The book maps closely to Susan Roberts’ 1974 book Witches U.S.A.. The author, a middle-aged female journalist, looks for those wacky magical people to interview–Wicker starts in Salem, Mass.–but then finds some rapport with some of them. In Wicker’s case, it’s hoodoo priestess Cat Yronwode. The section on gathering dirt from Zora Neale Hurston’s grave for use in hoodoo is priceless. Susan Roberts went on to be influential in the 1970s Pagan Way movement. It remains to be seen about Wicker and hoodoo. Jason of Zyphre points out a link to an audio interview with Wicker on Yronwode’s Lucky Mojo site. Maybe she will stick around. Alas, I’m too jaded to be shocked! shocked! by her revelation that magic–or at least magical thinking–is everywhere. When I see a chapter heading like “The Waitress Wears a Pentacle,” I think instead about the need for a good sociological study of class issues in the Pagan movement. But that isn’t Wicker’s purpose. She’s in four-wheel drive, barreling down the overgrown road cut in the late 1960s and early 1970s by authors such as Susan Roberts (Witches U.S.A.) and Hans Holzer (The New Pagans). The revival of interest in the occult and the supernatural is a current example of religious events that some have seen as being of great cultural signifiance and as reflecting serious social conflicts and strains of macroscopic importance. That’s not Wicker writing, but rather sociologist Marcello Truzzi in 1971. He wrote a lot about the “occult revival” back then, although he predicted that it would fizzle out. He is not in Wicker’s bibliography. Can you say “cycles,” boys and girls? People with, shall we say, expanded kinds of awareness are quietly blending among us, cobbling together spiritual lives that more freewheeling than anything else ever seen before. The waitress wears a pentacle under her blouse. The computer geek next door is a conjure doc. The mom down the street tells fortunes. Soldiers chant toward gods of war. Nurses send healing power through their hands. You have to know what to look for. You have to search them out, ask the right questions, notice the right signs, but they are there, here, everywhere around us. And she is off to the Vampire and Victims Ball in Salem, Mass., just the place that any researcher would start. If it gets better after Chapter 1, I will let you know.